This cereal takes a risk with an exciting new flavor. It doesn't really work, but it's nice to see Post taking some chances. Honey Bunches Of Oats Tropical Blends is made up "crispy mango flavored flakes" and "crunchy coconut flavored granola clusters". You know from the first sniff that you're in for a sensory challenge. The mango here has an extremely fruity flavor and smell. It tastes so authentic... it's as if some of your fruit juice dripped into your cereal. And that's the problem. I believe that Post succeeded at what they were trying to do. The cereal reminds me of Honey Roasted (or regular) Honey Bunches of Oats with real mango on top. They did it too well. The flavor is just a little bit shocking. Your tastes buds are sent into a state a disbelief. The first two bites... you're not sure what you're dealing with. The third bite... you think you might like it. By the fifth bite... you realize it's just a little too weird. By the end of the bowl, you're over it, but strangely happy to have participated in the experiment. I can only imaging the wild flavor combinations that are tried in the Post test kitchens. This cereal made me feel like an insider, as if they let me try one of the crazy concoctions that had little chance of going beyond the testing phase. At that point, they usually seek opinions. To which I'd say, "The mango is way too strong and I barely taste the coconut." I didn't hate this cereal. It was fun to try. I'll probably have another bowl at some point, but I doubt I'll finish the box if I have other options (which I do). 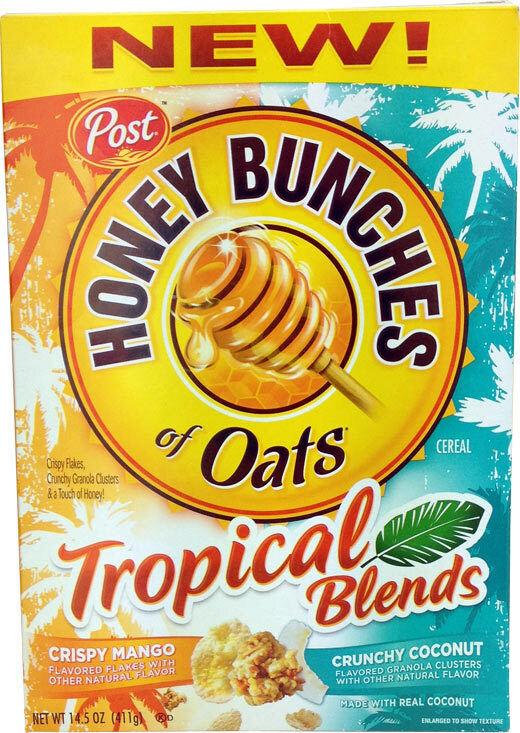 Nutritional Considerations: Each 3/4 cup serving of Honey Bunches Of Oats Tropical Blends has 120 calories, 2 grams fat (0.5 saturated and 0 trans), 0mg cholesterol, 135mg sodium, 24 grams total carbs, 2 grams dietary fiber, 6 grams sugar and 2 grams protein. 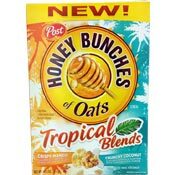 What do you think of Honey Bunches Of Oats Tropical Blends? I really enjoyed the Tropical Blend flavor, but I've looked in all the stores in my area to find this flavor and all I can find is the apple w/ granola kind. Where can I buy the tropical blend cereal? 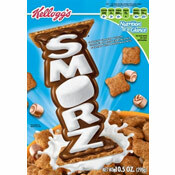 This is the best and the only cereal I want to eat - now I can't find it! Hope it is not being discontinued!